Elizabeth Ride: BAAG agents sometimes made outline sketches of shipping seen in HK harbour. Here are six dated 15 Sep 1944. Hugh Farmer: Straying somewhat from the industrial history of HK I thought however it would be of interest to find out a little more about these ships. A couple have a closer connection to HK that just being spotted in HK harbour. My main source of information has been wrecksite though a couple of the ships already have a mention in other articles on the website. Wrecksite usually provides a photo of the ship so you can compare what the BAAG agent saw, or at least drew, and what the camera took. As Elizabeth adds in the comment below These sketches are drawn from details memorised by BAAG agents (they obviously could not draw them in situ). 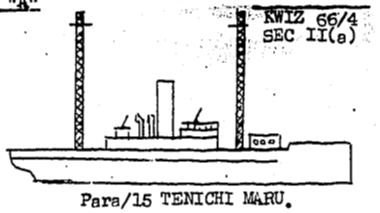 The sketches accompanied actual reports. 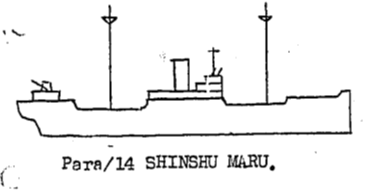 As you will see I cannot find details about the Tenichi Maru. Choan Maru – Luxury liner from the OSK line. No further information on wrecksite. However, Elizabeth has added notes describing the ship, its time in Hong Kong and especially in Taikoo Dockyards in the first comment below. Elizabeth has added further details about the ship in HK and of undergoing repairs at Taikoo Dockyards. Built 1935. Damaged by US submarine 23rd Oct 1943, sank the following day. Elizabeth adds in her second comment below further details about the ship’s time in HK and Taikoo Dockyards. Including – On 11.8.44 BAAG reported: “Work on this vessel which commenced in March 44 has been suspended pending shipment to Hongkong from Formosa of 1 and a quarter inch rivets which cannot be manufactured in Hongkong, the Taikoo dockyard being able to turn out 7/8″ rivets only”. Hugh – These sketches are drawn from details memorised by BAAG agents (they obviously could not draw them in situ). The sketches accompanied actual reports. 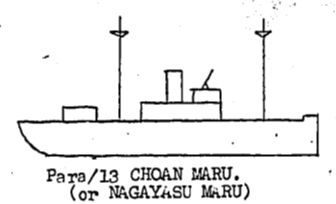 There are similar reports for approx 400 Japanese vessels and sketches of about 100 of them in the BAAG papers. I am glad to supply any of these. Best wishes, Elizabeth. Repairs: Entered Taikoo Docks for repairs to engine room. Many bullet holes were found on the sides of the ship. Vessel left dock on 25 Jul 44. 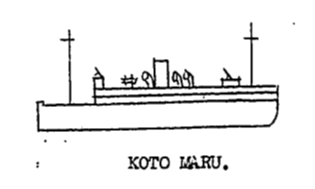 Reports re the HEIKAI MARU [Japanese characters]. On 11.8.44 BAAG reported: “Work on this vessel which commenced in March 44 has been suspended pending shipment to Hongkong from Formosa of 1 and a half inch rivets which cannot be manufactured in Hongkong, the Taikoo dockyard being able to turn out 7/8″ rivets only”. 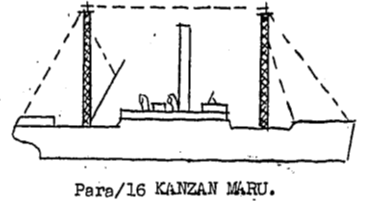 The Kanzan Maru was previously reported as S.S. “Kwongtung”. I have inserted a summary of the extra information you include about the three ships in these two comments directly into the main article.